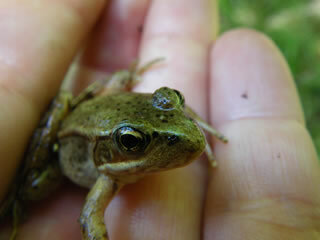 Amphibians are widely regarded as indicators of ecosystem health. Relatively few native species have been identified in the San Juan Islands, and their status and distribution are uncertain. 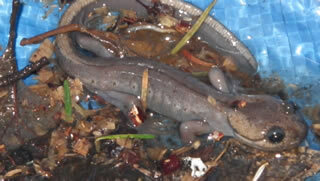 Of special interest are Ambystoma gracilis (Northwestern salamander), which is restricted to a single drainage basin on Lopez Island, and its close relative Ambystoma macrodactylis (Long-Toed Salamander), which is restricted to a single drainage basin on Orcas Island and a large wetland on Shaw Island. These woodland salamanders tend to roam widely in search of invertebrate prey, hide under decaying logs, and return to home ponds annually to mate. We believe they have only three home ponds in the islands. By comparison the Rough-Skinned Newt (Taricha granulosa) makes its home in more than a dozen lakes and ponds on at least four of the larger San Juan Islands, despite large annual losses as these animals cross roads while dispersing in the fall and returning to their home ponds in spring. Kwiáht provides homeowners with free Newt Crossing signs. Pacific Chorus Frogs (Pseudacris regilla) are widespread on the larger islands, but native Red-Legged Frogs (Rana aurora) are limited to a small number of relatively undisturbed streams. The Western Toad (Bufo boreas) is known historically from several islands, but may now be locally extinct. Kwiáht investigates all reports of these animals, as well as monitoring the expanding range of invasive and destructive East Coast bullfrogs (Rana catesbeiana). A major focus for 2019-2020 is systematic assessment of amphibians and aquatic reptiles on San Juan Island. 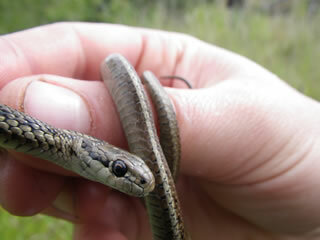 Reptiles are especially poorly documented in the San Juan Islands. There have been isolated reports of Rubber Boas (Charina bottae) on San Juan Island and Sharp-Tailed Snakes (Contia tenuis) on San Juan and Orcas Islands, but only garter snakes (Thamnophis spp) are relatively abundant and widespread on the larger islands. Thamnophis elegans, the Western Terrestrial Garter Snake, is an aquatic hunter and strong swimmer, while the Common Garter Snake (Thamnophis ordinoides) is well adapted to our wet climate by giving live birth and hibernating underground. Northern Alligator Lizards (Elgaria coerulea), also viviparous, have been documented on San Juan Island, and in two small isolated populations on the east and west extremes of Orcas Island. Western pond turtles (Actinemys marmorata) were last seen on San Juan Island 20 years ago. Western Painted Turtles (Chrysemys picta), native to the mainland, have meanwhile spread to at least a half-dozen lakes on the larger islands, and Red-Eared Sliders continue to be introduced by pet owners, where these non-natives co-exist, limited by their need to find warm dry sandy soil for their eggs in summer.